VA Loans | CalStar Mortgage, Inc. The goal of the VA Loan program is to assist American veterans with homeownership, often in situations where alternative financing is less favorable. 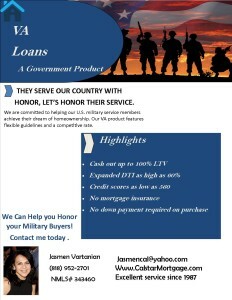 By guaranteeing home mortgages made by approved lenders, the U.S. Department of Veterans Affairs (VA) makes it possible for Florida veterans to receive excellent loan terms and conditions on home mortgages. At CalStar Mortgage, Inc., we are proud to provide veterans with some of the best rates and terms on VA purchase and refinance loans. VA loans provide many advantages compared to other mortgages and most veterans, military, and spouses of deceased military members are eligible to apply for a VA loan. Active-duty members won’t become eligible until after roughly 6 months of service and members of the National Guard and reservists must wait 6 years before they will become eligible. However, if called to active duty, they will become eligible after only 181 days. A Certificate of Eligibility (COE) will need to be obtained by those who plan on applying. You will want to try to get this as early as possible to avoid delays, but if you do not have your COE, we can help with the process. The VA does not require borrowers to have a specific minimum credit score but many lenders may set their own internal requirements. A score of around 620 is generally needed. Lenders may offer a bit of flexibility when it comes to credit scores, but lower scores may bring higher interest rates. W2 statements and pay stubs will be needed to verify your income and documentation of assets such as checking accounts, savings accounts, and other financial investments will also need to be reviewed. Veterans can take advantage of VA loans for purchasing a new home as well as refinancing an existing loan. Both Cash-Out Refinance Loans and Interest Rate Reduction Refinance loans are available to meet varying borrower needs. Cash-Out Refinance Loans – Cash-Out Refinance Loans allow current homeowners to utilize equity in their homes to obtain extra cash. This cash can be used for various expenses such as home improvements, remodeling, or high-interest debt consolidation. Interest Rate Reduction Refinance Loan (IRRRL) – Veterans can improve their current interest rate to save money through an IRRRL. This particular type of refinance loan is also referred to as a VA Streamline Refinance Loan. Whether you are a located in La Canada Flintridge, Glendale, Burbank, Sunland, Tujunga, Sun Valley, Pasadena, San Fernando Valley, etc our VA loan experts at CalStar Mortgage, can help you achieve your homeownership goals. For more information on California VA loans or to begin the pre-qualification process, contact us today.